The Searchers Sunday School Class is a dedicated and active group of Christian men approximately 60 years of age and up. We have 13 members enrolled with about 9 present each Sunday. Each week our class begins with a prayer list of issues and people for which we are concerned. We then enjoy our weekly lesson topic, feeling free to discuss the topic. Each of us sincerely wants to know how to apply Bible truths to our daily lives. The small size of our class opens the way for easy and informal discussion of the lesson. Of course it is up to each individual as to whether he wants to participate in open discussion and ask questions. We eagerly plan one or more social events for the class and our families each year. We truly enjoy giving our time and resources in projects such as the Heritage Crisis Pregnancy Center, the Empty Stocking Fund, the House of Care, and the Lottie Moon Offering for World Missions. When our church calls on us for some need, we always want to respond. Our teacher is Bill Cliff, a second generation member of First Baptist Church, having made his profession of faith in Christ in 1976. He now serves as a deacon, Professionally, he is a project engineer with the Georgia Department of Transportation. The officers of the class are: Billy Johnston, president; Melvin Fallin, secretary; Carey Goins, treasurer; and Chuck Delhart, assistant teacher. You can find our classroom by entering Building B on South Green Street, across from the main parking lot and the new multi-purpose building. Our classroom is on the first floor in the hallway to your left and is the second classroom on the right. Just look for the sign by the door. 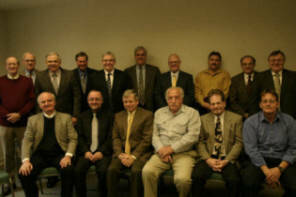 The Fellowship Class is a diverse group of 25 males, ranging from 65 to more than 80 years of age. This united group of men is committed through study, worship, prayer and obedience to the Lordship of Christ. Most of us are retired from our professions, but remain active in the lives of our church and community. We enjoy sharing God's word together every week and finding new means to apply it to our daily living. We participate with Empty Stocking families, contribute to the cancer car ministry and other worthy causes. We visit, pray and check on our church family as well as our class members, because we have a genuine love for one another. 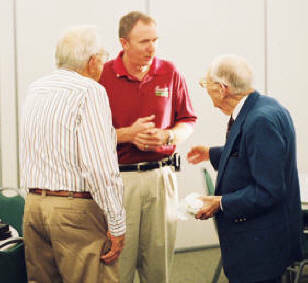 Bob Cochran has been our dedicated teacher for many years. His lessons are based on scripture with illustrations that create a lot of interest to help us understand and apply the scripture to our lives. In his absence we have two dedicated teachers who step in and take his place. Jackie Arnold and James Caldwell are both dedicated Christians who love our Lord and welcome an opportunity to teach the class. You can find our classroom by entering Building B on South Green Street, across from the main parking lot and Building C. Our classroom is on the first floor in the hallway to your left and in the first classroom on the left. Just look for the Fellowship sign on the door and you will be welcomed as a part of our group. 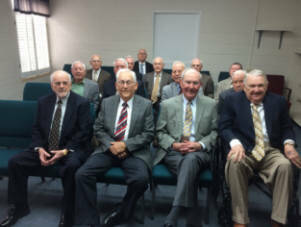 The Samaritan Sunday School Class is composed of men ranging in age from 35-60 years. The members have a wide range of occupations and hobbies and often arrive early to share in good-natured fun and fellowship. The membership is comprised of single, married, and divorced men who enjoy interacting with one another socially as well as in the study of God's word. Ed Trice, Jr., a life-long member of the First Baptist Church has been the teacher of the Samaritans for several years and is known for his thorough planning and interesting delivery of each lesson. He always strives to make every lesson relevant to the lives of class members. Ed has also served as a deacon for a number of years and he has clearly shown a willingness to be a servant to God's people. He is married and the father of three grown children. You can find our class by coming into the Green Street entrance of Building C, our new multi-purpose building. After you come through the lobby, we are the fourth classroom on the left on the main floor. "When the Layman's Missionary Movement began in 1096, Southern Baptist reacted quickly. On May 16, 1907 preceding the Southern Baptist Convention's opening session, Annie Armstrong's cousin, Joshua Levering of Maryland and Governor W. J. Northen of Georgia, called a meeting to discuss how Baptist men in the convention could be involved. From this meeting came the Baptist Laymen's Missionary Movement, the forerunner of the Southern Baptist Brotherhood. It was not until 1941 that First Baptist, Thomaston, organized their first Brotherhood. The Brotherhood held its organization meeting on December 1, at the suggestion of Mr. W.C. Day. Since that time there has been an organized group of men dedicated to a fellowship that seeks to help the church perform the task of teaching missions to men and boys, engaging them in mission action and leading them to support world missions through prayer and giving. The Brotherhood meets the first Monday night of each month at 6:30 pm in the fellowship hall. Dinner is served, a mission program is conducted, then a discussion of projects. The group sponsor the Boy Scouts, Boy's on Mission and participates in handyman projects such as building a ramp for handicapped cancer patients and constructing a booth for "Journey to the Manger". 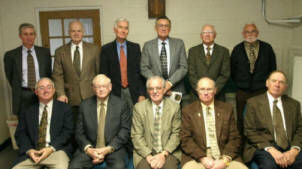 The Brotherhood ministry donates to their own treasury to fund mission work such as the Cancer Care Ministry and designated project of the church. Brotherhood officers for 2007-2008 are Melvin Fallin, President; Sam Gregory, Vice President; and Jim Franklin Secretary/Treasurer. We are committed to minister to men and through men, providing an environment where men are changed by the power of God to actively work in the church and community. Our Brotherhood's objective is to enable Christian men to grow closer to Christ, and each other and then reach out to all people in need, by helping in any way we can. Each of us has special God-given talents that we can use to help others. From Brotherhood, supported by the Southern Baptist Convention, to Baptist Men on Mission now sponsored by the North American Mission Board, the focus of this group has broadened in concept. 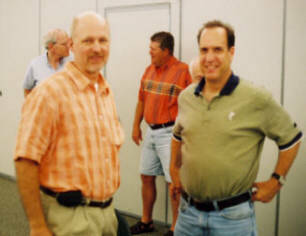 Prior to 1997, Baptist Men was resourced from the Southern Baptist Convention's Brotherhood Commission. It is now resourced from the North American Mission Board. Join Baptist Men on Mission (Brotherhood) on the first Monday night of each month, at 6:30 ;pm in the fellowship hall and prepare for the tasks of bringing men to God through Christ by fostering programs that will assist the churches in leading men, young men, and boys to a deeper commitment to missions, to a larger stewardship on behalf of missions, and to a personal involvement in missions. " Tuesday Morning Men's Ministry Group, open to all men of the church and community, meets every Tuesday from 7:00- 8:00 am for Bible study and prayer at the office of Dr. Dan Bramlett. Thursday Morning Men's Ministry Group, open to all men of the church and community, meets every Thursday morning at 6:45 am in the conference room of FBC located down the hall from the church library for coffee, Bible study and prayer. Contact leader Dannie Smith for more information.